16 Jul Glute Exercises You Haven’t Tried! 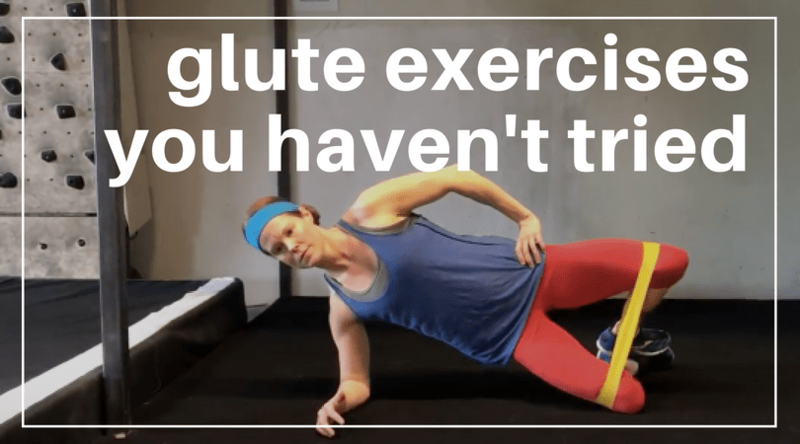 Note from Zach: I’m excited to have Meghan Callaway and Sarah Duvall back on TheBarbellPhysio to share this incredible article on training the glutes. These two incredible ladies have teamed up with Kellie Hart Davis to create their “Glutes, Core, and Pelvic Floor Workout System“. This product is amazing and I highly recommend taking a look at it! The glutes, perhaps more than any other muscle group, are very individualized in their training preferences. Some athletes will feels that squats crush their backside, while others get little glute work out of that movement. Some love hip thrusts, while others only feel back and quad work with them. Having a larger toolbox of glute exercises will help optimize your strength & hypertrophy gainz! Hip extension is a great way to work the glutes but it’s easy to cheat and overuse the back extensors instead. This locked lumbar position helps keep the back from overworking and really targets the glutes. It also tells us how tight your hip flexors are. If your hip flexors are really tight, then it will be extremely difficult just to lift your leg. Ready for the challenge? This variation of the lumbar locked hip extension makes the exercise a little bit easier but still helps keep the paraspinals from kicking in too much. This variation is a great alternative if the original is too hard. It’s also great if you feel any impinging or pinching of the tissue in the front leg. This decreases the compression on the hip and is an especially good variation for those with with hip impingement. This bang for your buck exercise strengthens the muscles of the anterior core, and doubles as a fantastic glute strengthening exercise. The leg abduction movement forces your core muscles to work to prevent your spine from hyperextending or rotating. As for your glutes, they must work to keep your hips from dropping and also rotating as the leg is moving away from the midline of the body. Aside from the leg that is performing the abducting movement, your entire body should remain in a fixed position. Make sure your shin is in a vertical position, or else your hamstring will be more prone to taking over. Extend your hips by squeezing your glutes, NOT by arching your lower back. In the top position, your body should form a straight line from your knee to your shoulders. Maintain this position for the duration of the exercise. Extend your other leg so it is in a vertical position. Straighten your knee, and point your toes towards you (dorsiflex). If you lack the mobility in the posterior chain, you may keep your knee in more of a bent position, but whatever joint angle you adopt, maintain this angle for the duration of the exercise. Keep your muscles in the moving leg relatively relaxed so they do not dominate the movement. This will force the muscles in your anterior core and glutes to work harder. Do not use your arms to “cheat” and anchor your body to the ground. Either cross your arms over your chest so they are not in contact with the ground, or lightly rest your arms on the ground but be mindful that you are not driving them into the ground to use as an anchor. This exercise combines an RKC side plank and a band resisted clamshell. As with any RKC plank variation, you should strive to generate a significant amount of tension in your core muscles. Combining this movement with the clamshell exercise adds in the element of anti-rotation as your core muscles and glutes must work to prevent your spine, torso and hips from rotating. The clamshell movement really strengthens the glutes, as does keeping the hips elevated for the duration of the set. Aside from the leg that is performing the clamshell movement, your entire body should remain in a fixed position. Try to limit any movement in your hips, torso and spine. Your body should be in a straight line from your head to knees, your shoulder should be roughly above your elbow, your knees bent, and feet stacked one on top of the other. For the duration of the exercise, imagine that you are trying to pull your elbow down towards your knees. This makes a tremendous difference. Contract the muscles of your anterior core as hard as you can and perform the clamshell movement. Once you hit your end range, return your leg back to the starting position. Make sure you do not allow the band to lose tension. Make sure to also engage the glutes and all of the core muscles on the side of your body that is closest to the ground. This is extremely important. I (Zach) first saw these from Westside barbell using their Athletic Training Platform which for this exercise can be mimicked with a resistance band attached to a dip belt. The central pull creates a force on your hips that leads to serious glute med work and marching for a minute as a glute finisher to a tough lower body workout can be killer! Kneeling hip hinges are one of my favorite exercises to use when wanting to improve someone’s hip hinge pattern for deadlifts, KB swings, etc. Add a resistance band to force the glutes to work hard to reach maximal hip extension and you’ve got a great exercise! Frog reverse hypers are a great exercises to work the glutes and I often find for athletes dealing with hamstrings that take over any hip extension movements that this variation becomes a go-to glute drill. I picked these up from the Glute Guy, Bret Contreras, as another drill to utilize in athletes having a hard time activating their glutes because their hamstrings take over traditional glute movements. The hip positioning in frog pumps essential knocks the hamstrings out of the equation and gives the athlete a great glute pump. Meghan Callaway is a strength coach from Vancouver, Canada. She has over 14 years of experience coaching elite athletes, post-physical therapy rehabilitative-strength training clients, to the everyday person who is looking to feel, perform, and function at a higher level. Dr. Sarah Ellis Duvall, PT, DPT, CPT, CNC is a wife, mom and adventure sports athlete, Dr. Sarah is a women’s health specialist that believes in teaching. Helping women understand how the body works is the basis for her results-driven online program. She focuses on issues from the pelvic floor and diastasis to building strength injury free. When she is not hanging off the side of a mountain, Sarah enjoys writing and presenting at Core Exercise Solutions and figuring out how her patients can continue to pursue their dreams and lead a strong, adventurous life. Their new “Glutes, Core, and Pelvic Floor Workout System” just launched and is an amazing asset for those wanting to train the right way!